The South Range Lodge is an exquisite area featuring six luxurious suites, a main lodge with amenities, incredible views and a lagoon style pool with swim up bar and walk down eating area. A place you will never want to leave. 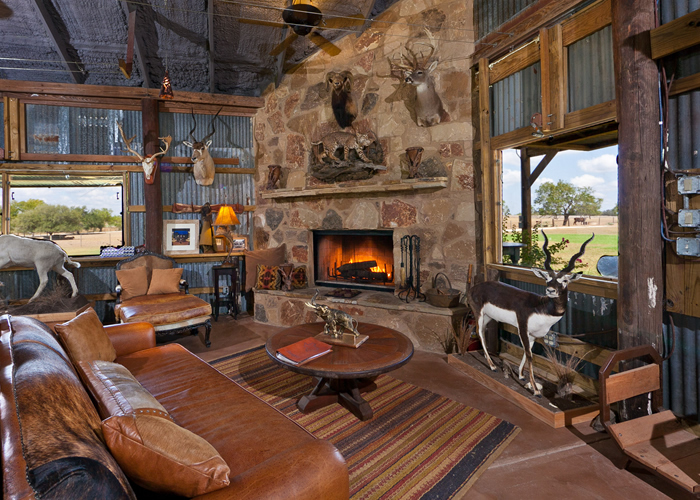 The South Range Lodge was once a barn on Governor Connally’s cattle ranch, something you will never believe when you step into it now. 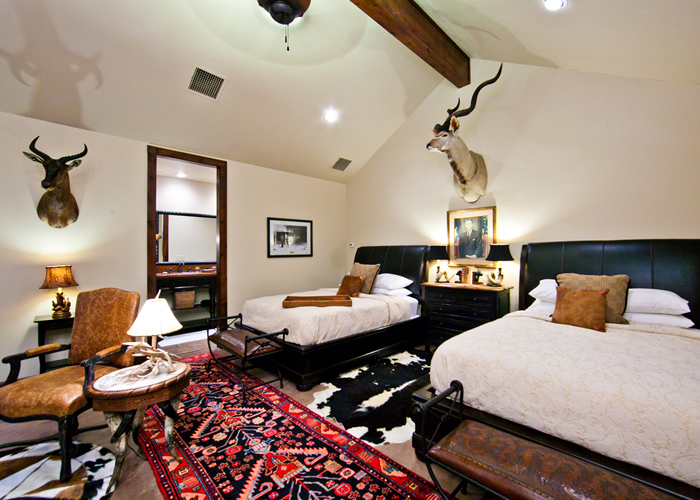 It’s been fully renovated to provide you with the ultimate in comfort and style. 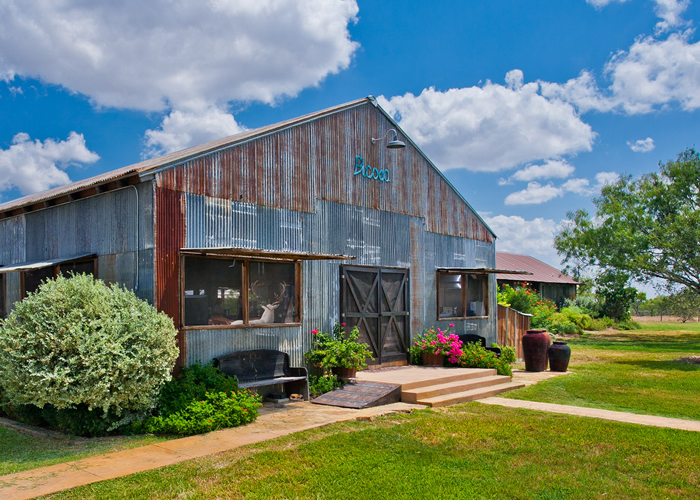 The South Range Lodge is an excellent meeting place for you to enjoy activities such as shuffleboard, pool and horseshoes. You can also cozy up next to the stone fireplace, catch up on the latest news on the numerous flat screen televisions or enjoy a nice meal at the impressive dining table. The kitchen and bar come fully staffed and well stocked with your choice of items. Directly outside the South Range Lodge sits an impressive fire pit, which is perfect for telling stories, catching up with friends and family and making s’mores - under the stars in the night sky. 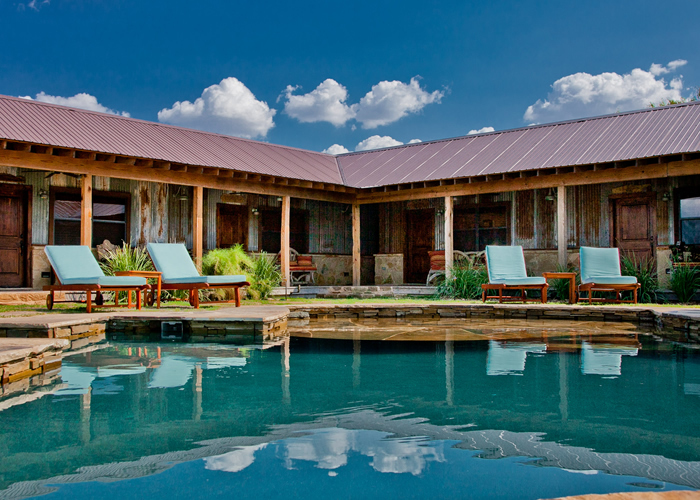 Featuring an alluring combination of elegance and Texas style, six handsomely appointed suites open to a breathtaking pool, which comes complete with a swim up bar and walk-down eating area. The suites maintain similar styles, but feature differing combinations of furniture, allowing you to choose the style of room that fits your needs. 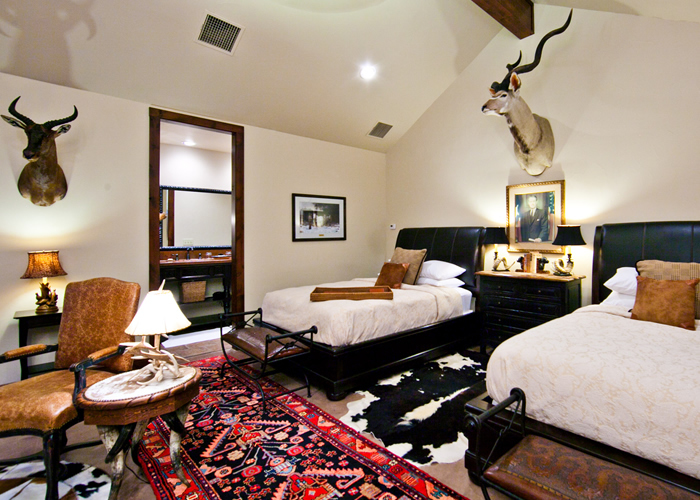 Each suite is detailed with hand tooled leather accessories and plush bedding. 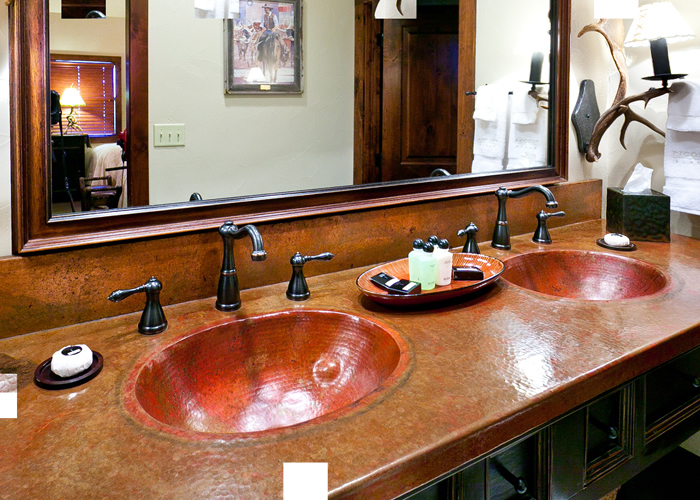 You will enjoy the luxury of an en-suite bathroom with double copper sinks and an oversized river rock shower. 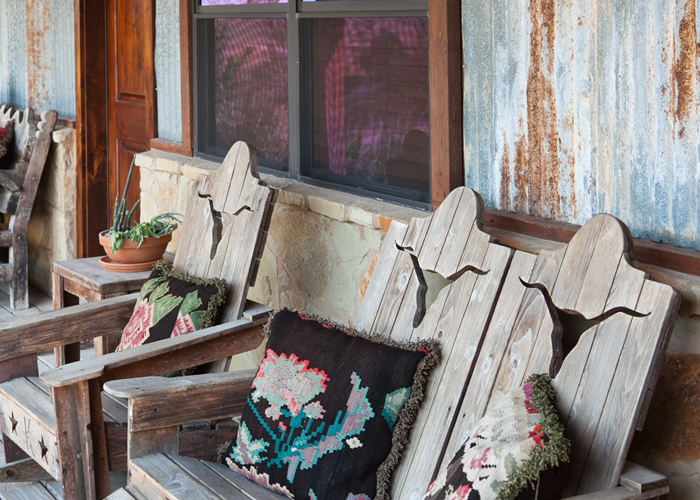 Enjoy your morning coffee or nightcap in the cozy sitting areas inside each room or step outside to the attached porch and relax in a rocking chair overlooking the captivating scenery. An extraordinary feature of the South Range Lodge is the luxury lagoon-style pool which boasts a swim up bar and walk down eating area. The pool is surrounded with native flagstone and luscious greenery. 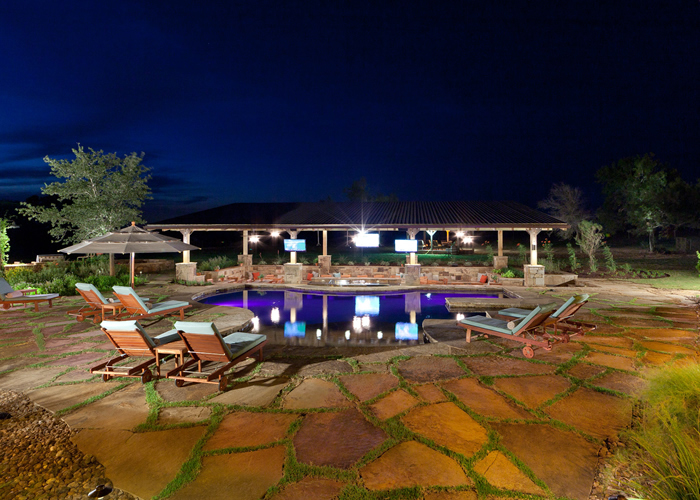 Relax in lounge chairs while reading or watching your favorite show on the three outdoor televisions. When it’s time for lunch, you can take a short swim up to the bar for a gourmet chef-prepared meal or enjoy the same cuisine out of the water in the The Pit. 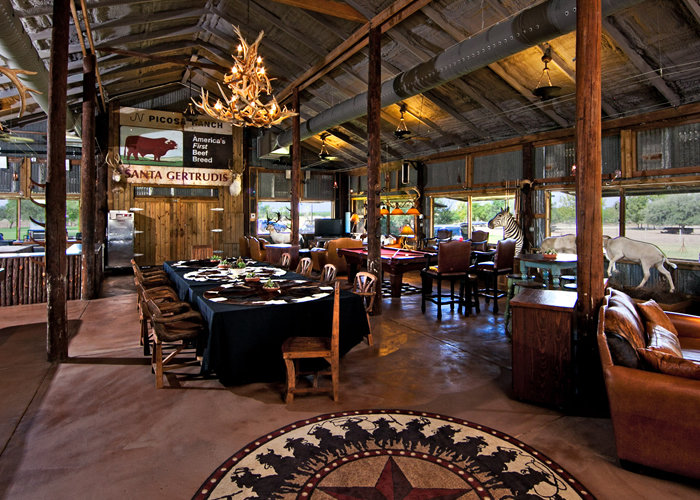 The Pit features a full kitchen and spacious eating area. Enjoy a meal out of the water at the stone-topped bar, comfortable wooden tables or padded bench seating along the wall, all while staying pool level with children or friends who are enjoying time in the water. 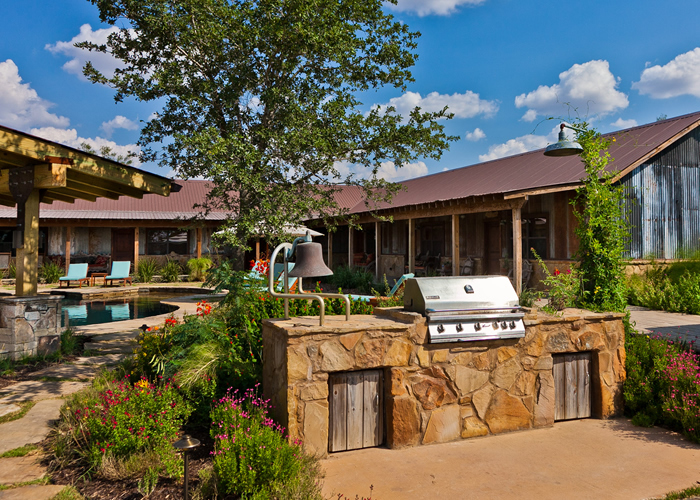 The 1,900 square foot metal roof pavilion features a spacious flagstone deck, stone bench seating and six ceiling fans to keep guests cool on those sunny Texas summer days. 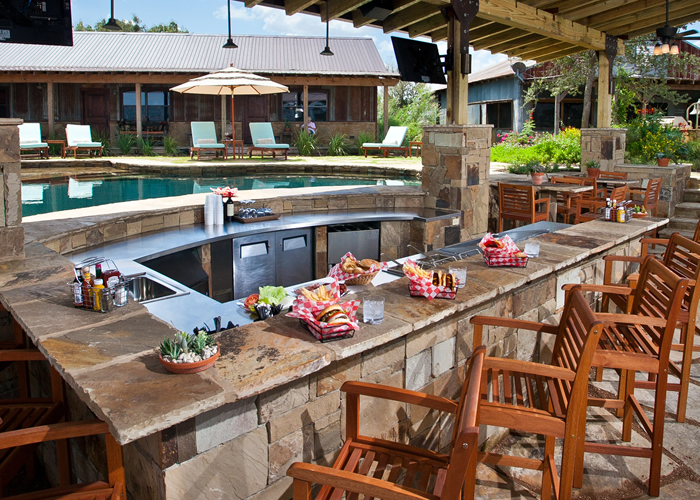 It’s the ideal place for hosting an outdoor dinner, enjoying lunch with family and friends or simply relaxing and enjoying the Texas scenery. 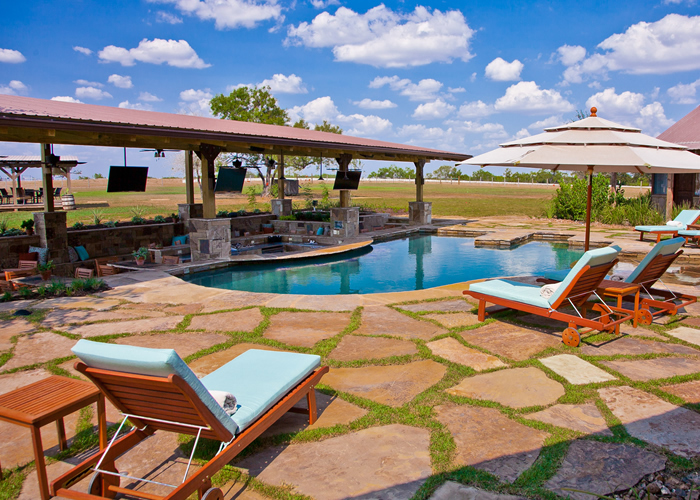 The pool features a shallow sun shelf allowing you to bask in the beautiful Texas sun while staying cool in the shallow water. Also notable is the swim up bar and relaxing cool spa complete with jets. The cool spa includes eight Hydrotherapy Jets, the perfect compliment to the warm Texas summers and mild winters. With the deepest point only reaching 4.5 feet, the pool is perfect for adults and children alike. Enjoy a meal out of the water at the stone-topped bar or comfortable wooden tables, all while staying pool level with children or friends who are enjoying time in the water. The entire area is outfitted with top of the line technology. One 60” and two 40” televisions work together to show one program or can be set to different programs allowing the children to enjoy Disney, while you catch the big game. A blu ray player will allow you to view your favorite movies day or night and the professional sound system will guarantee you hear it all. If television isn’t your first choice, don’t worry, we can set up your favorite music to play whenever you’d like. The surround sound system is also a great way to listen to your favorite music. Interested in visiting us? Contact us today to see if your dates are available.